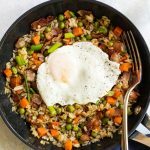 If you’ve ever wondered what to do with leftover rice from last night’s take-out dinner or other rice-based dish bacon fried rice is the answer. It’s a 15-minute recipe you can make for breakfast, lunch, or dinner. In a small bowl, combine the vinegar, soy sauce, and sesame oil. In an 8″ non-stick skillet, cook the bacon pieces over medium heat until they start to crisp up, about 3 to 4 minutes. Add the garlic and stir it with the bacon fat until it’s fragrant about 10 to 15 seconds. Add the brown rice to the pan and stir to coat it in the bacon fat. Add the peas and carrots and stir again until the peas and carrots are warmed through, about 2 to 3 minutes. Adjust the heat to medium-low to keep it warm while you make the egg. Coat a separate small skillet with cooking spray. Turn the heat to medium-low and add the egg to the pan. Cover the pan and cook the egg until the white is set, but the yolk is still runny about 3 to 4 minutes. Transfer the fried rice to a plate. Top with the egg. Season the egg with the salt and pepper. Garnish with the green onion and serve. I like to use two pans because it makes it easier to transfer everything to a plate, but If you don’t want to use two pans use a 10″ non-stick skillet to make the rice. Once you’ve made the rice, push it to the perimeter of the pan leaving a space in the middle to cook the egg.